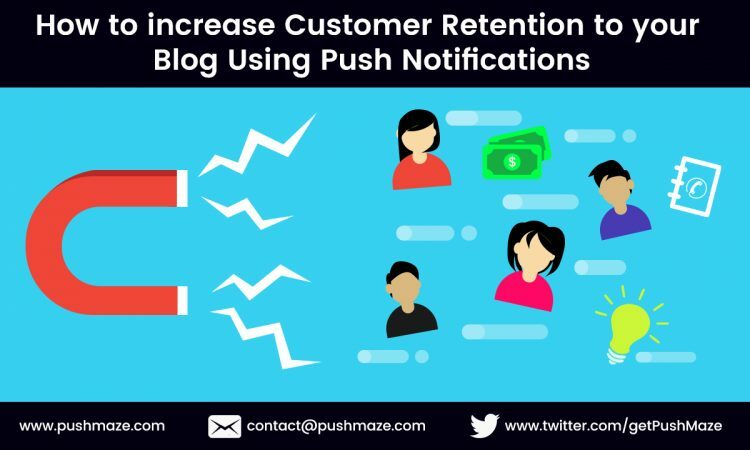 How to increase Customer Retention to your blog using push notifications? Did you know the probability of an old customer making a repeat purchase is 60% whereas a new prospect making a purchase is only 20%? Therefore, your old customers should always be under your special preference list. Similarly, for example, you don’t ignore or forget your old close friends even after new meet new ones. This is where terms like loyalty and customer retention come into the picture. Through website push notifications you can retain your customers and keep them engaged. Read on to know how. Your customers are your biggest assets. Strategize well to build a long-term business relationship with your customers. Even though many companies put their entire focus on acquiring new customers, however, some businesses still try to retain their old customers. What you can do is draw a fine balance between acquiring new customers and retaining the old ones. And with browser push notification you can do just that. These website push notifications work both on desktops & laptops even mobile web browsers. All you need to do is add a compelling and catchy one-line message, add a call to action and attach a landing page. This new marketing channel has become so popular that different industries are adopting it as an engagement and retention tool. Whether you own a travel portal, an online boutique or even an e-learning website – you can use browser push notification for your marketing communications. Notify your customer whenever there is any new update on your blog. It can be a new post, a new offer or any news – let the customers know. This will keep your customers engaged and informed. We understand that the same thing can be done through emails. But note that emails are now cluttered, they cannot be received in real time and they have spam filters. Your browser push notifications will be delivered on a preset time and frequency and you can reap the values. Start with an opt-in request to avoid any future spam trap. This will be the first point of interaction between you and your customer. By making your web push notification opt-in based you are asking permission to send future messages to your subscriber at regular intervals. Be clear on what they are going to receive. Offers, discounts, updates, and so all – say it all on day one. To increase engagement you can take your subscribers to a landing page after they click on the notification call to action. This landing page will have the notification details in brief. Your message on the landing page should be clear and lucid. Your customer will only be interested in your notifications as long as you are relevant and provide them with useful information. You cannot supply junk to your subscribers and expect them to keep following you. Send them relevant and related messages and keep them coming back to you. Push notifications mean a gentle nudge and not a hard push that will send your subscribers away from you. You simply cannot afford to lose them by bombarding them with messages. Therefore set the timing and frequency at which your messages will arrive at their browsers. This will ensure that your customers are engaged with your brand at regular intervals. Hence it is extremely important that you segment your subscribers as per their purchase history, browsing behavior, background and location. Add to that their time zones, type of browsers and devices they are using most to browse. Once that is done, you can launch micro-personalization campaigns. It is no use wasting time on too old customers or dormant subscribers. Allot time for active customers who have the purchasing power and you know that they will purchase in the future as well. Create a separate list for your dormant customers and launch a separate web push notification for them. As and when they become active, include them under respective lists.